Lihi Turjeman (b. 1985), is a young artist who I have been following for a while, with great admiration. Lihi graduated with honors her first degree studies in the Art department at the Bezalel Academy in Jerusalem, and is currently completing her MFA studies there. During her studies, she received the Lauren and Mitchell Presser award for excellence in painting, and the Joseph and Ada Bulapio award for outstanding achievements in the department of history and theory. 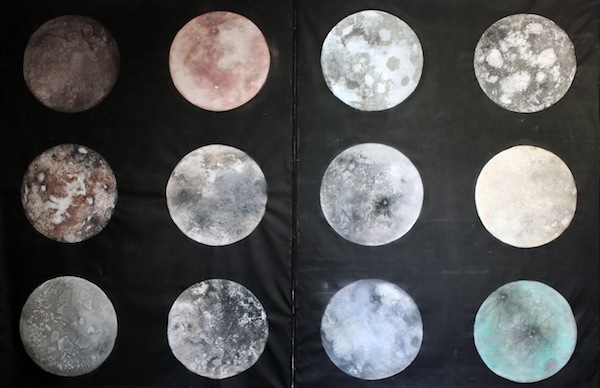 Until today, Lihi has presented four solo shows: in 2010 she exhibited her first exhibition, titled “At the Sight of”, at Julie M. gallery in Tel Aviv, in 2012 she showed “White Mule” at Rothschild 69 Projects, curated by Noam Segal and in 2013 she presented “Kushi-Atlas” at Julie M. Gallery and “2101” at Sommer Gallery. I met Lihi in her previous studio in the center of Tel Aviv and a second time, more recently, in her new studio in the industrial zone of the south of Tel Aviv. I had the chance to interview this up-and-coming artist about her paintings, philosophy and work process. Don’t miss the video accompanying this discussion, a beautiful documentation of Lihi’s studio at Brenner street. Sarah Peguine: Lihi, you just moved to a new studio. Your previous space, where you worked for five years, was a beautiful house at Brenner street in the heart of Tel Aviv. It stood empty for years as it was due for demolition. You inhabited the house and made it your home and studio. It also had a huge impact on your work, because you used the actual walls and space to create your paintings. For me one of the strongest aspects in your recent shows is the notion of memory. Memory of a place. I am wondering how this move from such an important and charged space to a much more ‘neutral’ studio is impacting you and your creation. ‘Brenner’ integrated into the urban fabric yet, in a small one way street, hidden by the huge ficus tree at the front, it was autonomous. 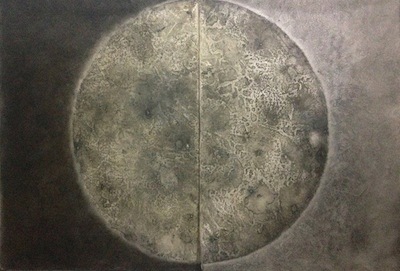 The space enabled me to be connected and isolated from my surroundings at the same time. In my current studio, it is a whole different story. It is a massive industrial concrete structure full of workshops, factories, and halls: an operative surrounding, in which the building is the city. Therefore I would not call it ‘neutral’, because so many people are in that same container everyday, working and functioning and its energy, atmosphere and fast tempo impact me. So far, I do feel rootless, detached. In Brenner, I was haunted by the place and possessed by the POTENTIAL and possibilities that I recognized there. In this new studio or in more generic spaces I am the generator of things- the hunter. I only came to the new studio for a short term; I want to think of myself as a guest here. Yet, in every place I stop, I look for specificity. It is important for me and my work. The studio is at the top of this structure, where one can see the wide open sky and horizon. 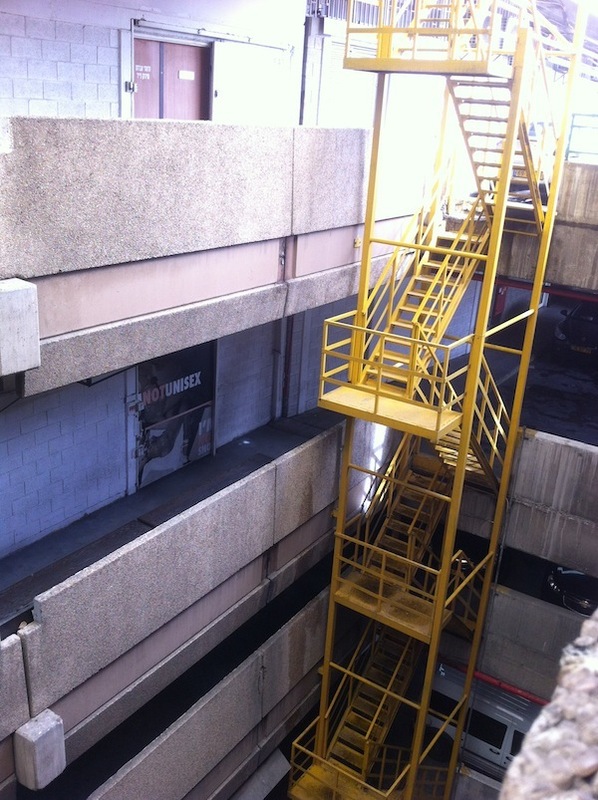 It is all open: there is a great contrast between the dominant matter and color of the concrete and the sky. That is the first thing I noticed when I came here- in Brenner I could see the moon only inside the frame of the window. Sometimes, detachment from a place can make us be sharper, more aware to nuances and differences. SP: You even filmed the building’s demolition and your process of creation in the space. Was that part of your grief? Why did you feel the need to document it? LT: The building in Brenner was not only my studio for five years, it was also my home. So it was important for me to document my work and the space, as a trace of my personal story and the development of my discoveries in the place. There were layers of cultural and personal histories buried in the building that I digged through during these five years. The documentation of the building and its demolition is also a mirror to the development of Tel Aviv, we build sand castles. The notion of home and what makes a ‘home’. Capitalism and the city’s unstable thirst for development, consistently destroying the layers of the past and the diverse histories in order to build identical ‘modern’ high-rise buildings. It happened to me but it continues to happen all around Tel Aviv and all around the world. I documented the destruction with my eyes open. I was not grieving yet I was shocked. And I wanted to record this moment, this feeling both for myself and others. SP: Let’s go back to your new studio and new body of work. 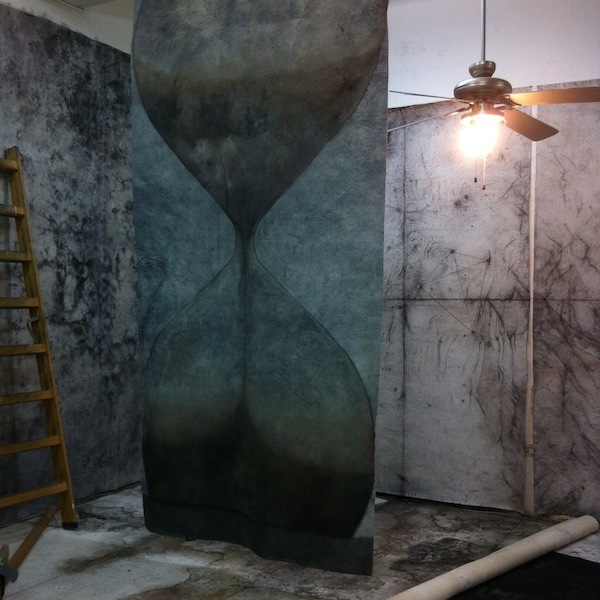 I feel that physicality is still very present: the use of the actual space, your intervention as an artist, the medium itself and the viewer’s relation to it… I especially noticed it in the large painting of the hourglass, which can be seen on both sides of the canvas. How does your work on the smaller paintings relates to this aspect? LT: This painting of the hour glass is called ‘The 8’. It is a hybrid of formalistic and allegorical desire. The number is hidden in the object and actually constitutes it. Drawing the figure eight is the way to draw the image, stretched to the edges of the canvas. In another work, the numeral seven lays out the architectonic image of the columbarium. I am sensitive to multiplicity, contrast and duality in things, the spectacle, the phenomena. The glass is a two sided piece that among other things relate to my interest in the bilateral, but it is very primary in my mind .This is actually the act of situating in space, and not just along its sides. Like a lot of my work motivations, it is the scale that counts, human scale. Scale is composed of size and format but also consists of weight and material properties and more factors that I have not discovered yet. The paintings are the ground, land, and very connected to the place where they are. The map at the Kushi -Atlas exhibition which I presented in 2013 at Julie M., was a territory. For me, Three-dimensional attitude is acute, but I have no intention to pour everything into this experience. The bilateralism that I offer here, still preserves the essence of painting, however it also challenges its existence as a ‘screen’. In my small paintings I follow the enigma and the focus is on the appropriation and the choice, obviously you have more control on the work. The large scale is my way to share, to allow participation and intimacy for the viewers. SP: I am also curious about your technique. Your studio reminded me of a laboratory, where you prepare and invent new materials. This again relates to the physicality I referred to in my previous question. Technically what kind of materials do you use and why? LT: I want to understand the way things operate in the world rather than to grasp their meaning, and this notion dictates many of my tendencies towards material. I am attracted to raw state materials, where the color is immanent: like in charcoal, graphite, gold, metal, iron oxide, sand. On the other hand, I also produce materials that follow my thoughts and desires, and I am drawn to materials and a palette that echo our reality. I work with plaster for example, as well as with the tools that come with it. I am interested in the physical gestures that follow the use of such a material and with the connotations associated with it. Materials associated with thought and passion. The green radioactive color is both a visual and conceptual choice. Material preferences relate to our soul, mind, biography and conceptions. It is a network, a subjective grid that we develop. The foundations exist but we keep adding and discarding. 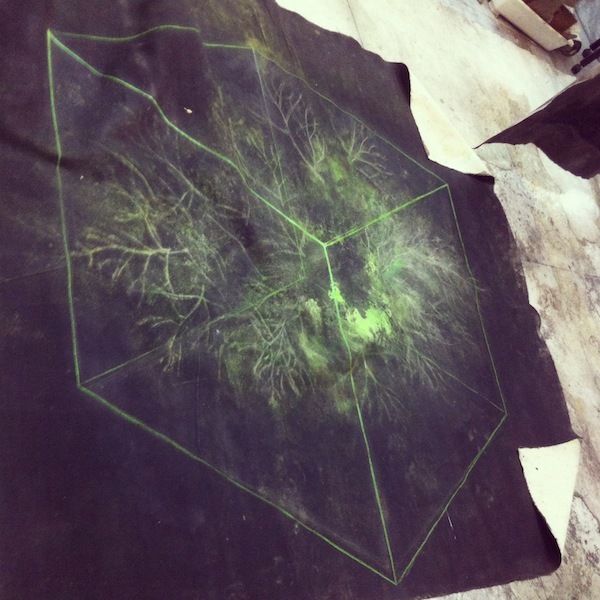 From Lihi’s studio- ‘The green radioactive color is both a visual and conceptual choice’. SP: In your paintings it looks like you are inventing a new language: your own imaginary symbolism, mixed with a kind of mathematical order. Is this what you referred to when you told me your work is like a “didactic mysticism”? I loved that expression. LT: Didactic mysticism. I play with this title a lot. 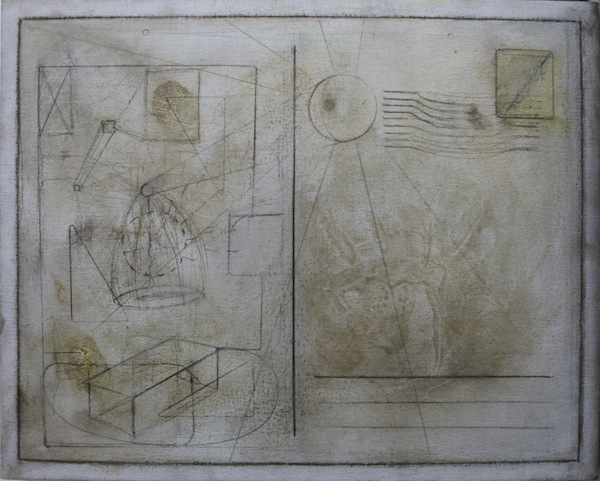 The didactic part represents the formation of things, the fixation of thought, spirit and emotion in some materiality, both on the surface of the canvas and within the space. I am fixing things in the material, fossilizing them. 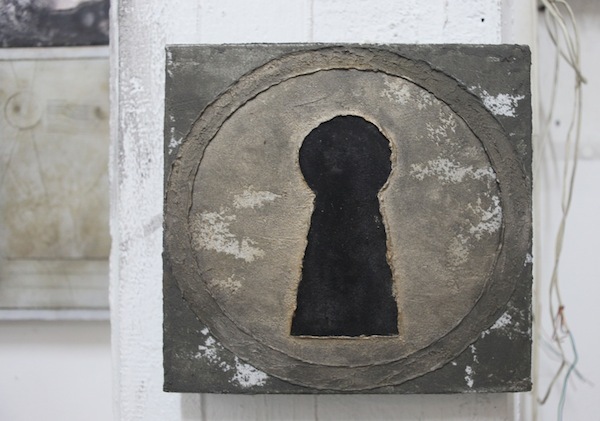 For example, when I placed a feather on the canvas, it becomes locked in time, it is not resting on it. In order to continue with my work, I have to invent and develop a language, one that would fulfill my artistic needs. Sometimes the language is your prison and sometimes it is your freedom that enables the creation, the playing. You understand? Some time ago, I had a studio visit, with one of my teachers. I felt that the studio was dismantled; it was a minute after I left Brenner. I had some MRI photographs of my mother’s damaged brain, taped to the window, a few experiments and sketches. Then Eli told me an anecdote that in the past, when the X-ray was invented, the doctors, scientists and rationalists, had to explain to the common people how this invention differs from the crystal ball. Foresight was so associated with mysticism and prescience, so this invasive technology that exposes what cannot be seen looked like a miracle. For me symbolism is still foggy and odd, the symbol and the Meaning do not longer hold the same relations as in the past. So even if you have a tendency to symbolization, it is very complex and has to do with the media, technology, the saturation of images, multiculturalism, etc. The use of identified objects and images, like the icons and emoticons on the iPhone, could be seen as being on the edge of kitsch, but I think that with a System of Internal codes, prescribed amounts, connections and sensitivity, it could also be way beyond it. Precisely this ambiguity of the symbolic significance interests me. 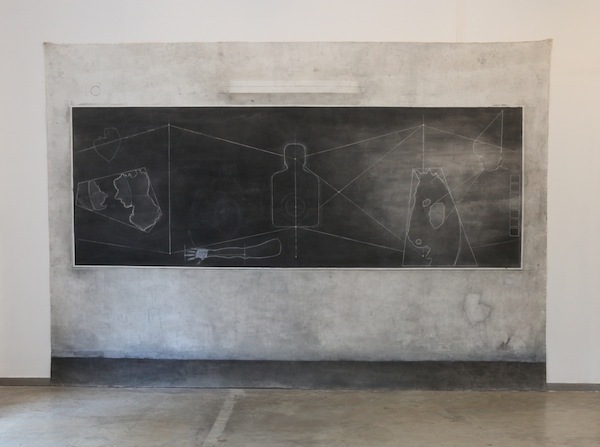 In ‘Blackboard’ for example I laid out a geometric network which links the various images that appeared in previous works, ‘12 moons’ is made from twelve different materials/gestures that exist in my studio memory. These are indexes, that you can do once in a while, when you ‘stop’, or when something stops you, and it helps me notice the genealogy of the signs which exist or are hidden in the studio. This is the ‘didactic mysticism’, the way I see it.